The British Virgin Islands are considered the best sailing destination in the Caribbean. Year-round warm weather, consistent trade winds and line of sight sailing make it a sailor's paradise. BVI YACHT CHARTERS should be your first port of call when looking to sail around the islands. 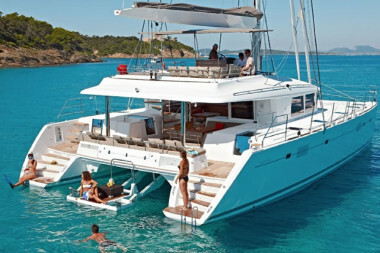 We offer catamarans and monohulls, crewed yachts or bareboats. You can come for a few days or a few weeks and a professional and dedicated team are on hand to make your time with us the trip of a lifetime. Our fleet ranges from 31ft to 54ft and all yachts are of the highest standards. The British Virgin Islands locally known as NATURES LITTLE SECRETS, are easily the best sailing destination in the Caribbean, and arguably one of the best in the world. Warm weather year round, consistent trade winds and line of sight sailing make the BVI a sailors paradise. Our beautiful country is made up of over 60 islands and cays, mostly unspoiled, with fabulous white sand beaches, plentiful marine life, crystal clear waters and a relaxed island vibe. There are the spectacular boulders of Virgin Gorda and the picturesque village and beaches of Jost van Dyke along with the diversity and seclusion of the other 40 sister islands, islets and cays. There is no better way to explore the delights of the BVI than by sail boat. Offering sheltered waters with minimal tidal currents, few unmarked hazards, line-of-sight navigation, excellent navigation aids, short hops to new destinations. 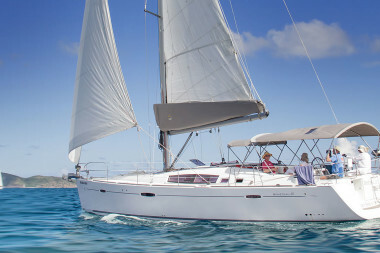 BVI YACHT CHARTERS is your first port of call when looking for a yacht in the BVI. Whether you are looking for a Catamaran or a Monohull, a week or just a few days, a crewed yacht or a bareboat, our professional team is on hand to make it work your way. Our fleet is dedicated to sailing, ranging from 31’ to 54‘, all maintained to the highest of standards. Come and experience the smooth sailing, relaxed atmosphere and attentive customer service we have to offer. Our fleet of Monohull, Catamaran and Crewed yachts range from 31ft to 54ft. All are newer models and always meticulously maintained. Our bareboat catamarans vary in age, some absolutely brand new and some that have been in charter for a few years but have been well maintained and kept up to date. Most of our fleet is between one and five years old. A crewed yacht charter is a perfect blend of first class cruising on a luxury liner and the freedom of your own private yacht. There are no deadlines or sailing schedules on a crewed yacht, the only one is happy hour! 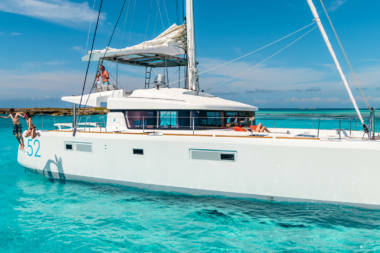 BVI Yacht Charters can put you at the helm of a brand new Beneteau, Jeanneau or Fountaine-Pajot. Choose many new models ranging in size from 31-58 ft. We can guide you in selecting the yacht and features to meet your personal requirements as well as those for charter if that is your goal. As an owner, you can enjoy unlimited sailing time aboard your yacht. The number of weeks you choose to sail and the time of year are up to you. And, you can feel confident in knowing that your investment will be maintained to a high standard by our professional and caring team. BVI Yacht Charters offers both charter and private yacht management. Call us today to discuss which option is right for you. LOOKING FOR A PRE-OWNED YACHT? Boatshed BVI, our yacht brokerage division, offers a great selection of pre-owned sailing yachts. Register on-line at bvi.boatshed.com and see up to 70 photos of every boat for sale. Kirstie is our friendly, knowledgeable Boatshed representative. Just some of our over 1000 great testimonials. We endeavor to respond to all emails the same day, assuming they come in before we close. Usually we will reply within a couple hours! Please direct all enquiries of any subject to charters@bviyc.com, which is our front desk and we will distribute accordingly. The email address is monitored at frequent intervals throughout the business day including weekends and holidays.